Zebra ZT420 printer has a maximum print width of 168mm and is available with 203dp and 300dpi resolutions and provides advanced industrial printing, rugged reliability and loaded with features. The Zebra ZT420 is part of the Zebra ZT400 series of printer. The Zebra ZT420 barcode label printer is designed to grow with your evolving business needs, featuring increased processing capabilities and an open operating architecture providing flexibility to support your evert growing and changing application requirements. It offers RS232 serial, USB 2.0, 10/100 Ethernet and Bluetooth 2.1 interfaces as standard. Options include UHF RFID, parallel (bi-directional) interface, wireless ZebraNet 802.11 a/b/g/n, label rewind and cutter. 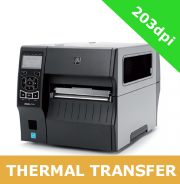 The Zebra ZT420 printer is a 6" wide printer that is part of the Zebra ZT400 range of printers.